It's been a few days. This schedule that I'm running is turning out to be all consuming. Between class, projects, work, and the kids, I just don't have much time for anything else. It's sad really. But time marches on. The main reason I'm posting today is because I had 4 major art projects due today. Between them all, I put in something like 36 hours this week. I am beat! But done! Because I really like it when people give hints tips and tricks along with their art, I'll do the same here. This lovely lady was sketched out on 140 lb. watercolor paper. I used watercolor pencils and acrylic paint. Her kimono is a piece of scrap booking paper that I scored from Michael's for $0.15! and collaged onto the watercolor paper using Gel Matte Medium. Once dry, I cut her out. On a 16x20 canvas, I used acrylic washes for the sky and grass. Once dry, I began some of the details. Trees are my arch enemies. I've never in my life ever ever ever been able to draw a realistic tree. I was on Skype with an artist buddy of mine while painting this and for what ever reason, it just flowed. To add the bark and highlight details, I used oil pastels. On canvas, it gave it a really "scratchy" appearance. 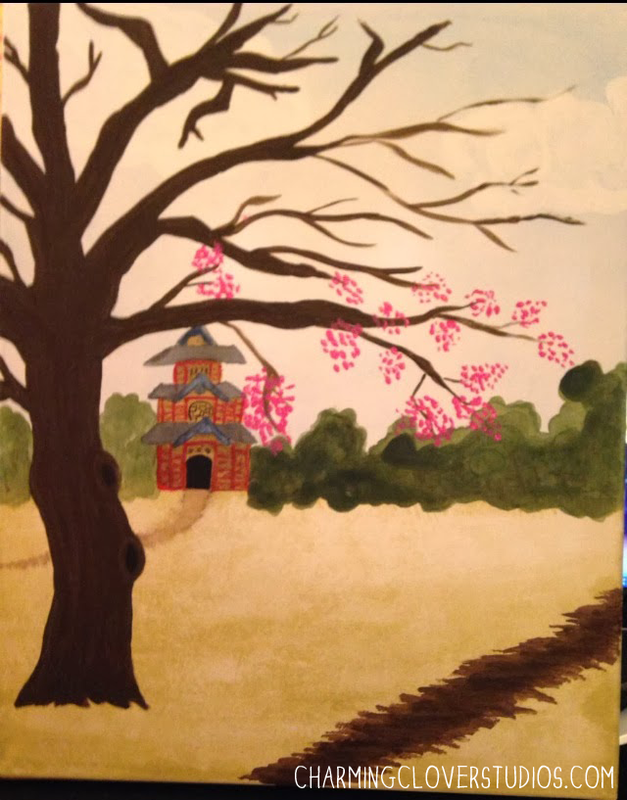 I had gotten so excited about painting the actual blossoms, that I'd forgotten about background details. Silly me! So I tossed in some nondescript bushes and a temple. After I'd painted this icky brown path along the bottom right of the canvas, I decided I absolutely hated it. But it was done and I really didn't want to try to gesso over it and start over. Mainly because once you use gesso, acrylic washes don't behave properly. And I was digging the grass. Oh well, I'll figure out something later. Also used oil pastel over the path to give it some texture. 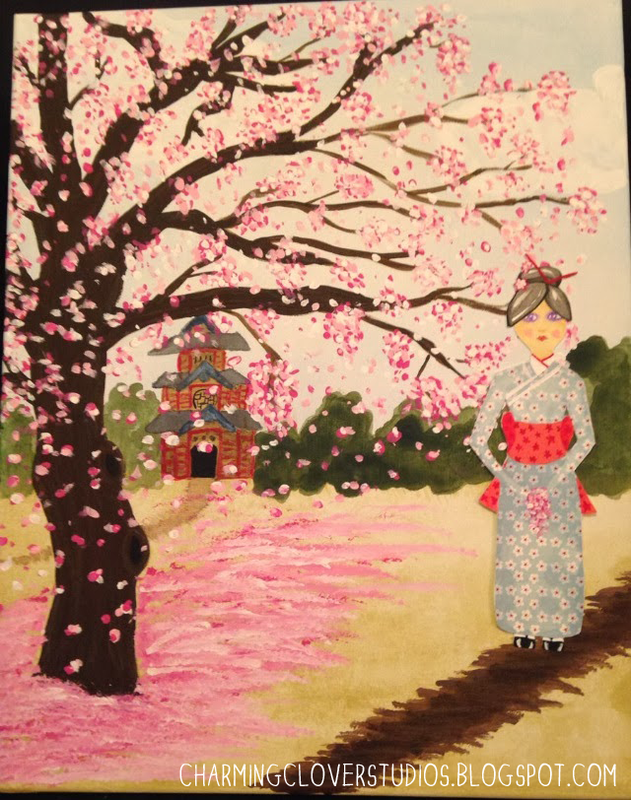 Point blank...I was too excited to do my cherry blossoms than really think clearly. But they turned out wonderfully, didn't they? 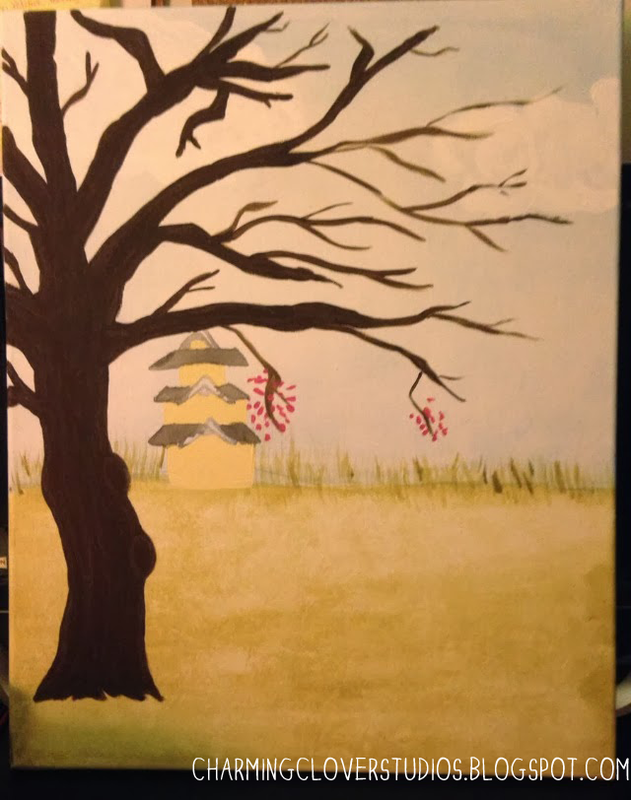 Used acrylic for the blossoms. 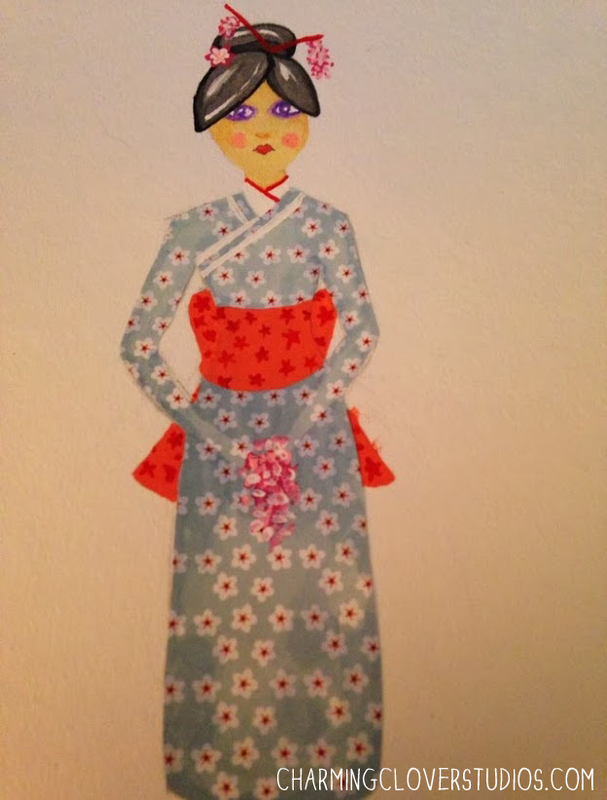 I collaged my geisha using Soft Gel (Matte) Medium. I love that stuff. Wow, what a difference sunlight makes when taking a picture! To "fix" that ugly path, I added lots and lots of blooms around my geisha. I'm not uber thrilled with them, but if I keep messing with it I will end up destroying the parts I love. So I'm leaving it alone. The edges of the geisha are curled slightly. I left it like that because it creates a natural shadow behind her and gives it a little bit of a 3-D effect. So, yep, there you have it. 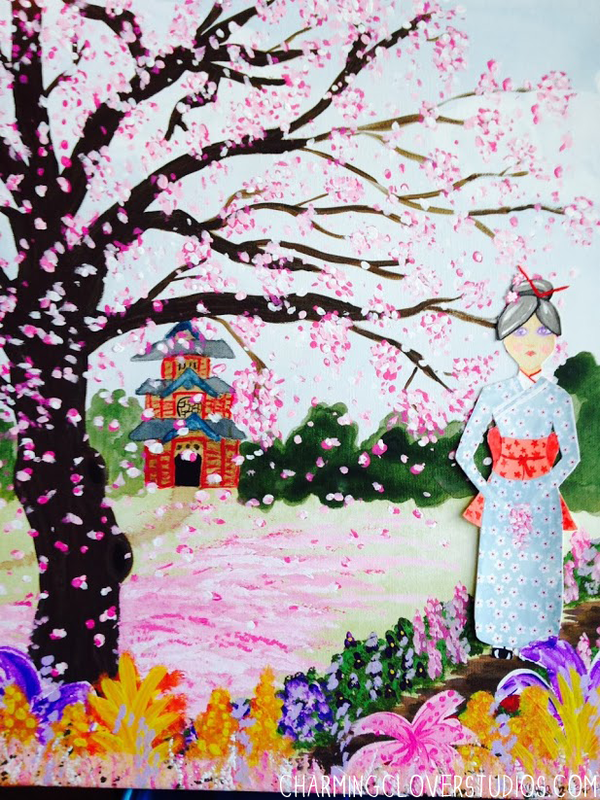 One geisha walking in her magic garden. That's what the assignment was - to draw a "Magic Garden". I took mine in a bit of a different direction than my classmates have. But I figured, why not. And I'm in love with this tree. I will definitely be trying another cherry tree or two at a later date. 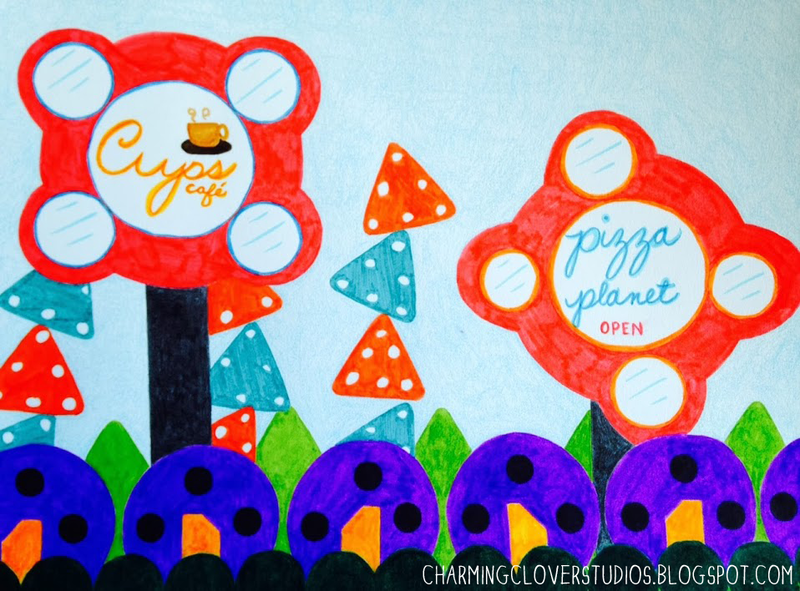 Assignment 2 was a futuristic city with only geometric shapes. Nothing much to it, just had fun. Media used: 90 lb mixed media paper, markers & crayon. Assignment 3 was to draw a still life using the positive space. 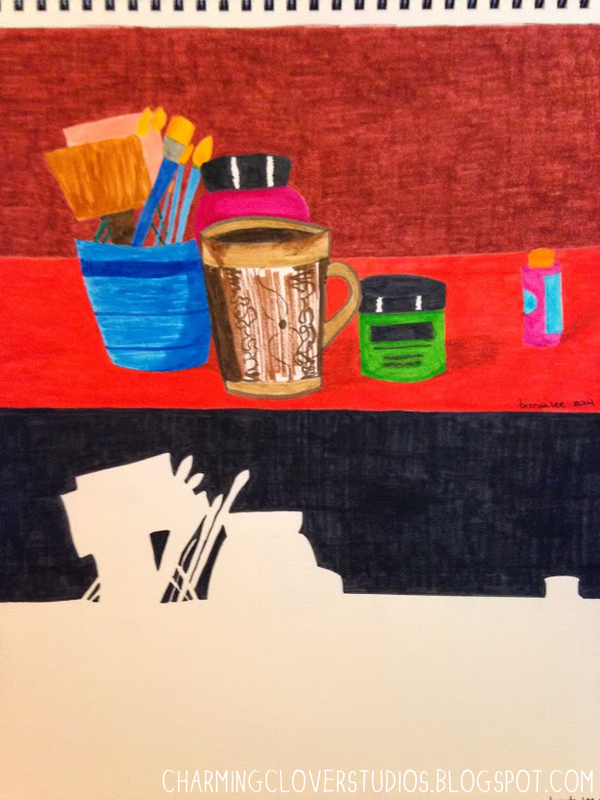 Assignment 4 was to draw the same still life using only the negative space. So yep, I'm done. For this week anyway. I have 2 more art projects due next Friday for the same class. I'm sure I'll put up at least one of them here. And maybe I'll get around to finishing Mr. and Mrs. Owl.